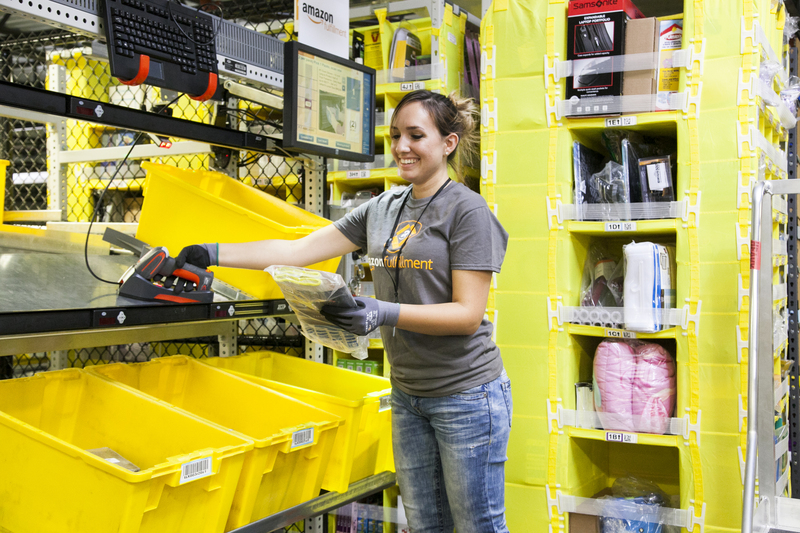 An Amazon employee at one of its fulfillment centers. Image source: Amazon. Amazon.com announced in December that it was investing in the India-based start-up company Housejoy, taking the lead in a $22 million investment round designed to expand the young company&apos;s presence on the South Asian subcontinent.The investment is small for a company like Amazon, but it&apos;s just one part of a multibillion-dollar plan to compete in India&apos;s burgeoning consumer market. Amazon&apos;s revenue in North America was 81% greater than its combined revenues from the rest of the world in the third quarter of last year.But given the size of the opportunities abroad, this is bound to change. CEO Jeff Bezos said last year that its retail sales in India were poised to pass $1 billion in record time. Amazon saw huge potential in India and has committed billions of dollars to grow its presence there. At this rate, revenue from the country could one day meet or even exceed that from North America. BusinesssegmentopportunityThe specifics of the Housejoy investment are intriguing. The start-up"offers in-house computer repairs, beauty treatments, bridal services, maintenance and home repairs to Indian consumers," explained a recentFortunearticle. This product offering may seem like it falls out of Amazon&apos;s area ofexpertise -- online retail -- but it fits perfectly into the company&apos;s broader strategy. Amazon is a company built around a broad mission statement, which allows it to expand and evolve in ways that a company with a narrower focus can&apos;t."Our vision is to be Earth&apos;s most customer centric company; to build a place where people can come to find and discover anything they might want to buy online," boasts Amazon&apos;s mission statement. It once seemed crazy to order books online, but that changed.Next came online sales of household products, clothes,electronics, and nearly every other physical product under the sun. Consumers then began streaming television shows and movies, storingpictures on Amazon&apos;s Cloud, and selling their goods through the company&apos;s online marketplace. Now people want to buy offline services online, and Amazon&apos;s investment in Housejoy is a testament to how big this online-to-offline (O2O) market could be in India. Clicking and ordering beautytreatments or home repairs could eventually seem as normal as buying groceries from Fresh Direct, or ordering dinner on Seamless (both areas Amazon operates in as well). Chinese search giant Baidu, while focusing primarily on the Chinese O2O market, has recently made inroadsinto India as well. Suffice it to say that when big players like these find an opportunity to be compelling, it often is. India is on pace to become the world&apos;s most populous country by 2022 and has less than 20% Internet penetration. Population growth and an increasing number of Internet users will provide opportunities for a lot of winners in the Indian O2O space, and betting against Amazon and Jeff Bezos when he has his sights set on something has not proven to be a winning formula in the past. The picture will never be totally clearThe Housejoy deal exemplifies why it can be difficult to wrap one&apos;s head around Amazon as an investment. The company is involved in a number of different business lines, new initiatives, and product builds. Many of these will fail, and some will be home runs that continue to drive the company forward. There is no clear blueprint for what Bezos will do next, except continue in his efforts to "build Earth&apos;s most customer centric company." With that as my framing point, I feel confident Amazon will continue to innovate, expand into new markets, and remain one of the world&apos;s greatest businesses. If it succeeds on those fronts, over time, the share price will follow suit. The article Amazon.com, Inc. Is Making Headway in India originally appeared on Fool.com. James Sullivan owns shares of Amazon.com and Baidu. The Motley Fool owns shares of and recommends Amazon.com, Baidu, and Qualcomm. Try any of our Foolish newsletter services free for 30 days. We Fools may not all hold the same opinions, but we all believe that considering a diverse range of insights makes us better investors. The Motley Fool has a disclosure policy.